The UN Security Council has unanimously approved tough new sanctions on North Korea in response to its latest launch of a ballistic missile that Pyongyang says is capable of reaching anywhere on the US mainland. The resolution, drafted by the United States and negotiated with China, drew criticism from Russia for the short time the 13 other council nations had to consider the text, and last-minute changes to the text. One of those changes was raising the deadline for North Korean workers to return home from 12 months to 24 months. US ambassador Nikki Haley said after the vote that "the unity this council has shown in levelling these unprecedented sanctions is a reflection of the international outrage at the Kim regime's actions". The resolution caps crude oil imports at four million barrels a year. And it caps imports of refined oil products, including diesel and kerosene, at 500,000 barrels a year. This represents a nearly 90% ban of refined products, which are key to North Korea's economy, and a reduction from the two million barrels a year the council authorised in September. The new sanctions also ban the export of food products, machinery, electrical equipment, earth and stones, wood and vessels from North Korea. North Korea's test on November 29 of its most powerful intercontinental ballistic missile yet was its 20th launch of a ballistic missile this year, and added to fears that the North will soon have a military arsenal that can viably target the US mainland. 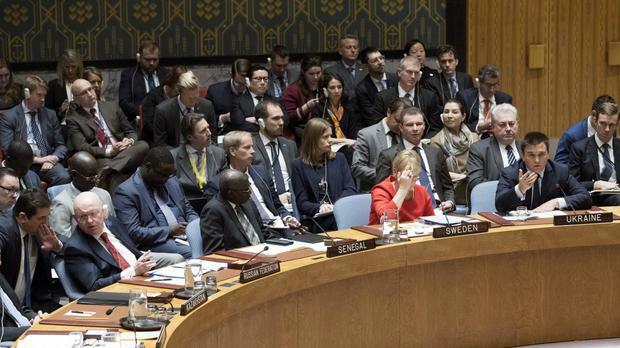 Britain's UN ambassador Matthew Rycroft said the Security Council is sending "a very strong united signal to the North Korean regime that enough is enough, that they must stop their nuclear programme and they must stop their intercontinental ballistic missile programme". The previous sanctions resolution was adopted on September 11 in response to North Korea's sixth and strongest nuclear test explosion on September 3. Ms Haley said at the time that the Trump administration believed those new sanctions, combined with previous measures, would ban over 90% of North Korea's exports reported in 2016. Those new sanctions banned North Korea from importing all natural gas liquids and condensates. It also banned all textile exports and prohibited any country from authorising new work permits for North Korean workers - two key sources of hard currency for the north-east Asian nation. The US Mission said a cut-off on new work permits would eventually cost North Korea about 500 million dollars (£373 million) a year once current work permits expire. The United States estimated about 93,000 North Koreans are working abroad, a US official said. The resolution approved on Friday expresses concern that the foreign earnings from these workers are being used to support the country's nuclear and ballistic missile programmes. It requires all countries to send North Korean workers and safety monitors home by the end of 2019.